We are offering Galvanized Corrugated Sheet. We have been dealing in the manufacture, supply, wholesale and trade of Galvanized Corrugated Sheets. 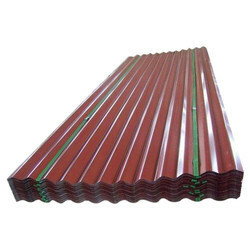 The offered corrugated sheets are basic building materials and components, which are used in the roof construction of buildings. Our supplied corrugated sheets are capable of withstanding the saline moisture in marine areas. Length: 8 ft to 14 ft.
Used In: Industrial Sheds, Workshops, Housing, etc. 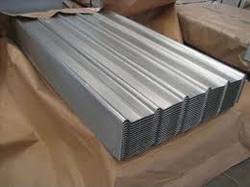 Our firm is trusted by patrons for providing Galvanized Corrugated Sheets. Moreover to this, these presented Galvanized Corrugated Sheets are favored by consumers due to quick delivery..
Matkawala Steels supplies Galvanized Corrugated (GC) sheets to specific CLIENT requirements. It not only specialises in thin guage corrugated sheets with thicknesses as low as 0.12mm suitable for low cost roofing for residential homes and industrial sheds but also roofing for heavy industrial housing with thickness upto 1.2 mm. To furnish diverse requirements of our clients in best possible manner we are offering a wide range of GI Corrugated Sheet. Offered products are highly reliable in nature and are available in different specifications as per the clients needs .